Dialogue Story: This lesson continues from the previous one. In the previous time lesson, Lisa and Freddie get up late. In this lesson, they arrive late for school and get punished by the school headmaster. They end up coming home late too. 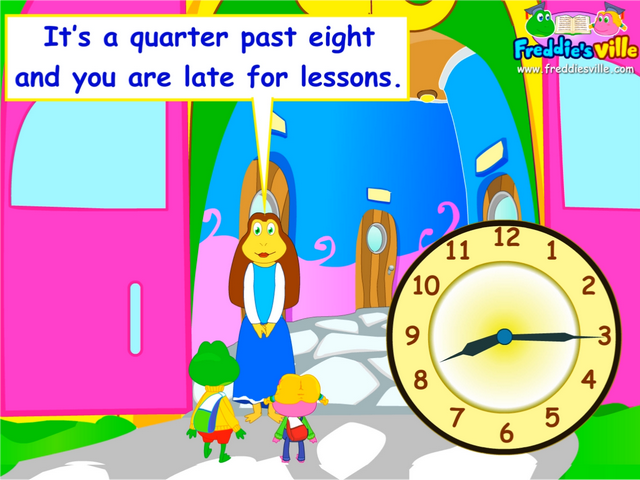 It's a quarter past 8 and you are late for lessons. We usually go to bed at a quarter to 11. It's 3:30 pm and our lessons are over for today.